College basketball has begun and, if you were paying attention to the world of sports, you may have actually noticed! No sport struggles to lift off the ground with any level of national hype like college basketball. Despite the big names squaring off in the Champions Classic and every team across the nation having played a game or two (Colorado and Canisius are the last two teams to start their seasons, each doing so tonight), college hoops has barely made a blip in the national sports conversation. College football is careening towards the playoffs, the NFL is as hot as ever, and the NBA has not only great games, but a litany of soap opera situations. College basketball tried, with four top ten teams squaring off at the Champions Classic. This year though, that event barely cause a ripple, scheduled during the buzz of Election Night. I struggle to think of how the sport as a whole could place it’s best foot forward. Perhaps a title game rematch would generate some hype, like this Thursday’s Michigan-Villanova game. In some years, a Cinderella like Butler would detract from the possible reach of that situation. A more intense version of ESPN’s 24 hour marathon event from years past could be a solution. When push comes to shove, any non-conference games with no stakes could be treated like glorified preseason. The sport may require a truly inventive idea, like that of John Calipari, who suggested starting the season with conference tournaments. Tony Bennett faces a task that no coach in men’s college basketball history has ever tried to attempt before this year. Bennett’s Hoos were, as we all remember, the first top seed to ever lose in the first round of the NCAA Tournament. Five contributors from last year’s Virginia squad return, bringing high expectations with them. 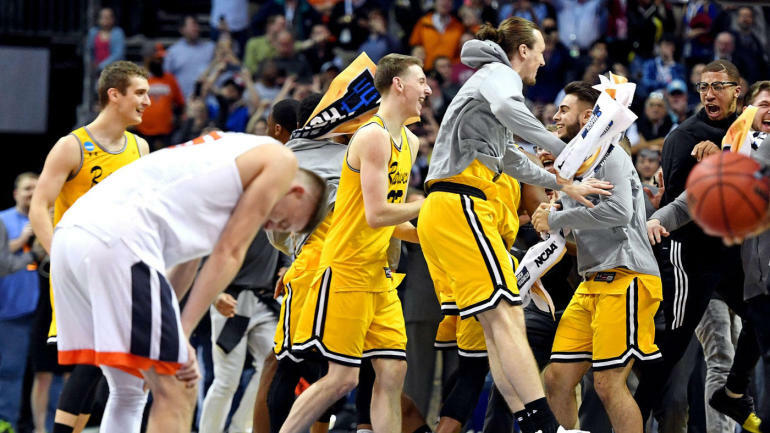 Every broadcast and opposing student section will, without fail, mention the Cavaliers loss to UMBC last March. As fans and viewers, we’ll certainly be sick of those replays well before Valentine’s Day even rolls around. It remains to be seen how Bennett and players like Kyle Guy, Ty Jerome, and Jack Salt bounce back mentally this season. The most intriguing returning Virginia starter notably did not play in the loss to UMBC. Sophomore De’Andre Hunter was ruled out of the entire NCAA Tournament with an injury, just days before the madness tipped. Despite playing only 19.9 minutes per game last season, Hunter’s absence in the UMBC game was abundantly clear. He attacked the rim like no other Virginia rotation player, taking 33 percent of his shots at the rim. Hunter led Virginia in usage rate and fouls drawn. The Cavaliers continued to shoot jump shots as UMBC’s lead grew, with little penetration or aggressiveness on dribble drives. Many sought to condemn everything about Virginia’s style of play after its historic loss. With Hunter taking a larger role and the brutal memory of last March always looming, the college basketball world will keenly monitor exactly how this Virginia team plays game to game. Bennett’s teams have always been deliberate and patient, and have always found success doing so. This season, the Hoos aren’t exactly changing their stripes. Virginia’s free throw rate is down and 3-point attempts are up, though in a small sample size. This team is talented, experienced, and figures to be well-coached. If they can shake away the Ghost of March Madness Past, the Cavaliers can compete in the ACC and beyond. If you’ve already been tuned into college hoops, you’re probably screaming at me for burying the lede and talking about anything in the world before getting to Duke’s loaded freshman class. Coach K brought the top three recruits in the current freshman class to Durham, in what is being heralded as the best group of first year players since the Fab Five (though Kentucky’s 2015 crop deserves mention there as well). The Blue Devils wasted no time making a splash, beating Kentucky by 44 in one of the largest drubbings Big Blue Nation has ever endured. The class was highlighted by Canadian prospect RJ Barrett, who is leading Duke in scoring and usage so far through two games. In two games, Barrett has already put up 45 field goal attempts, thanks in part to the Devils playing a high tempo style and maximizing their scoring chances by keeping turnovers low. Barrett is flanked by Cam Reddish, who has shown an equally quick trigger finger. Reddish is looking to shoot his way to the top of the NBA Draft, hoisting 21 threes in two games, sinking 10 of them. So far, however, Barrett and Reddish have been, somewhat expectedly, overshadowed by high-flying forward Zion Williamson. The Spartanburg, South Carolina native brings one of the most unique games to college basketball that I can remember. He developed a cult following online as a high schooler thanks to a seemingly never-ending stream of eye-popping dunks. Williamson leaps as quick, high, and powerfully as any basketball player in recent memory. Notably, he is not built like most ceiling-scraping jumpers like Vince Carter or Zach Lavine. Williamson is a cube of Grade A beef, weighing in at over 285 pounds. He looks and moves like a young Charles Barkley after a run-in with a radioactive superhero machine. Williamson is snatching rebounds with ease, shooting over 80 percent, and swatting 3.5 shots per game. If you’re looking for a reason to watch college basketball, Zion Williamson is it. He’s the most likable Duke player…ever? Find their schedule and watch him play, as much as you can. The Villanova guard has a chance to do something historic this season. Booth could be the first men’s college basketball player to win three National Championships since the 1975 UCLA Bruins. He’s served so many roles for Jay Wright’s teams over the last few years and he will continue to develop in his final season on campus. At times, Villanova needs Booth to be a scorer. At others, he’s expected to create for others or operate the offense. He’s nearly always needed as a defensive stopper and key cog in Wright’s plans to apply full-court pressure. Booth will turn 23 in December, making him one of the most seasoned players in the nation. His leadership will be crucial for a Villanova team now needing contributions from freshman and lesser used underclassmen. As five-star recruit Jahvon Quinerly learns his role and the offense, Booth will be crucial in keeping the Villanova machine rolling. Hi, there. Do you like college basketball? Not like, casually. Not like, “Yeah I’ll watch in March or like, if Duke plays a big game.” No, I’m looking for those with that deep, weird basketball love. That’s you? Great. Then let’s talk about Mike Daum. If you answered “yes” to the questions above, there’s a good chance you already know who about Mike Daum. For the less initiated out there, let me explain. Mike Daum is a senior forward for the South Dakota State Jackrabbits. In his three-year career to date, Daum has averaged 21.5 points and 8.2 rebounds per game. He stands 6-foot-9 and 245 pounds, while shooting 43 percent on 6.5 attempts from long range last season. Put simply, he’s been the most dominant scorer in college basketball for the last two seasons and now he’s back to set basketball on fire. Daum has topped 30 points on 24 different occasions in his career. That list includes a career high of 51 and a game where he made 10 of 15 from three-point range. He’s posted 14 or more rebounds 10 times. He played 48 minutes in one game last year. I could continue listing crazy Daum stats, but I will stop here and allow Daum to continue building his legacy. He’s played three games this season and topped 20 points and 11 rebounds in each of them. Pray for the defenders tasked with slowing him down in the Summit League this year and the major conference program matched with the Jackrabbits next March. If you’re worried about catching Daum in televised games this year, mark December 4 (at Memphis) and December 15 (at Nevada) on your calendars. Penny Hardaway is Um, Something? In title, Anfernee “Penny” Hardaway is the head coach of the Memphis Tigers. Beyond that, there’s not much more we can say right now. Hardaway comes, not from a lesser collegiate program or the NBA, but the worlds of high school basketball and the AAU circuit. For Tigers fans, it must be exciting to have a hometown hero and alum back at the helm of their program. Yet from a larger basketball perspective, there are a variety of unanswered questions. We can assume Hardaway’s strength will come on the recruiting trail. His recent experience has come on the other side of that transaction, coaching AAU and fielding offers from college coaches, but we have no idea what to expect from Hardaway as a gameplanner or in-game coach. He may be great, at both. He also might be an unmitigated disaster! We are entirely unsure of how he plans to have Memphis play this season, in terms of pace, scheme, or style. For a program with the Q-rating of Memphis, this is extraordinarily odd. When was the last time a relevant college basketball school welcomed a coach with no proven track record to lead the program? In his first game on the sidelines, Hardaway’s Tigers topped Tennessee Tech, with nothing particularly intriguing standing out. We’ll continue to monitor Memphis this year to see if hiring Hardaway was an innovative move or a short-sighted PR splash. Most Cinderella NCAA Tournament teams lose their senior leaders and return as a new team, with a new destiny. Their previous March success puts a target on their back and creates a layer of expectations. Loyola-Chicago follows a similar script, thanks to their Final Four run last season. Several key contributors have left, though head coach Porter Moser, Missouri Valley Conference Player of the Year Clayton Custer, and center Cameron Krutwig all return for another taste of Madness. The Ramblers are the obvious favorites in the MVC and will be under the microscope all season long. 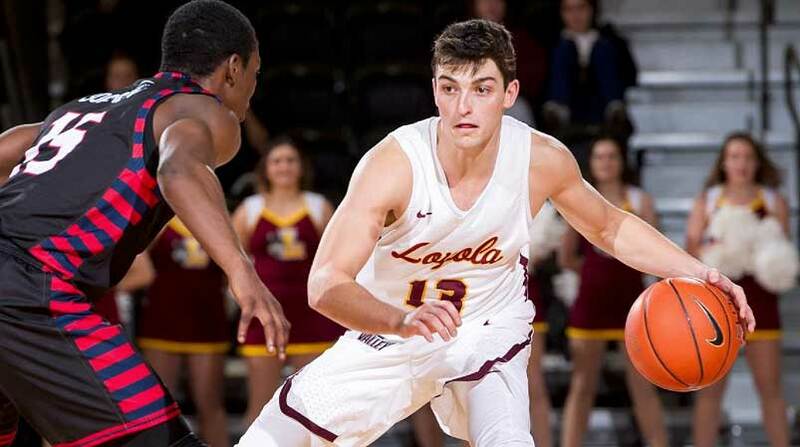 Case in point: Loyola made waves by losing a home game to a mediocre Furman team. The Ramblers shot just 3 for 20 from outside the arc and blew a 13 point second half lead. This may have been a cold shooting night early in the season, yet that can kill a mid-major club. Every bad loss makes the Ramblers chances at an at-large bid a bit more difficult. Loyola-Chicago can bounce back by beating Maryland or Nevada out of conference. For the first time since March of 2014, Bob Huggins will begin a season without Jevon Carter and Daxter Miles in his backcourt. No two players in recent memory more epitomized the style of the coach, program, and school than Carter and Miles. Both played like recently freed pitbulls, anchoring Huggins’ vaunted full-court pressure defense. Already, the Mountaineers have hit a bump in the country roads, losing their season opener at home to Buffalo in overtime. That loss looks worse on paper than it is in reality; Buffalo is pretty darn good. The Bulls won an NCAA Tournament game lasts season and have looked great so far this year, earning the 25th spot in this week’s AP Poll. Yet the Carter-and-Miles-sized holes in the West Virginia lineup couldn’t have been more apparent after just one game. West Virginia was in dire need of elite perimeter defense, allowing Buffalo star CJ Massinburg to hit 9 threes and score 43 points. Huggins’ teams play fast, but they rarely allow 90+ points or lose the turnover battle. In fact, the loss to Buffalo was the most points West Virginia has allowed since 2010 and the fourth worst turnover margin by the Mountaineers in that time. Despite a handful of rotation players returning, a loss like this could be indicative of future trouble. Carter and Miles were the corner Jenga blocks that supported everything Bob Huggins wants to build upon. There’s an odd situation west of the Rocky Mountains in college basketball: the two best teams are mid-majors. The Pac-12’s reign as best in the West comes crashing down this season. 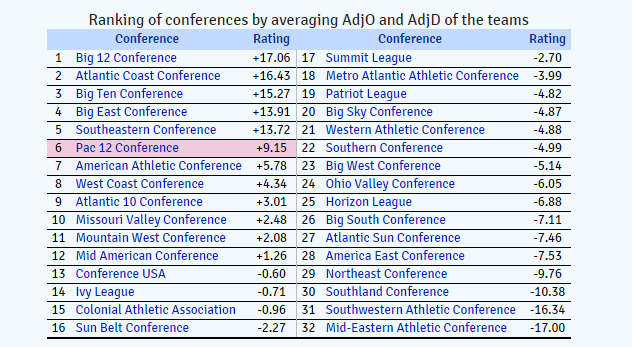 Ken Pomeroy’s metrics paint a stark picture, showing the Pac-12 grading out more like a second-tier conference than one of the big boys. Two Pac-12 schools are ranked in this week’s AP Poll (Oregon and UCLA) but both are outside the top 12. Inside the top six are two talented West Coast mid-majors – Gonzaga and Nevada. Mark Few returns five key Zags from last year’s squad, and adds two key transfers to his rotation. Although All-American glue guy Killian Tillie suffered an injury setback and won’t play til nearly Christmas, Gonzaga still figures to be a major player at the top of the polls all year long. Rui Hachimura’s assimilation into college basketball is complete, with an athleticism that is matched by few defenders. The Japanese-born forward should dominate around the rim and in transition, flanked by shooters and slashers in the half-court. Meanwhile at Nevada, Eric Mussleman is building something special. To date this season, nine players have touched the court for Musselman’s Wolf Pack. 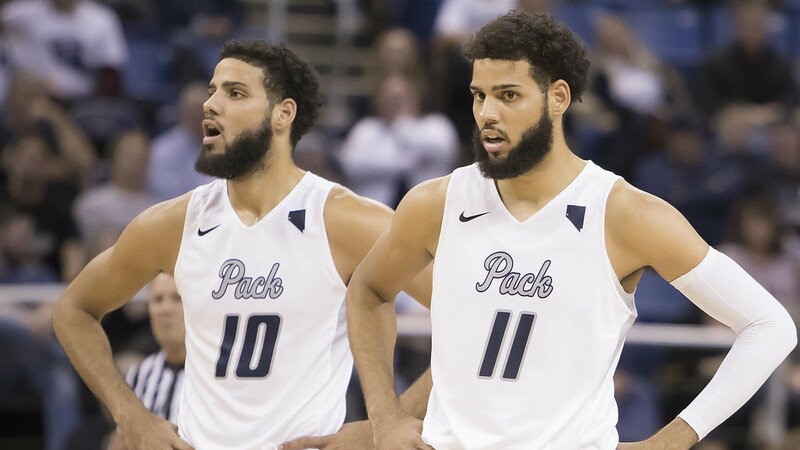 Only one of those nine started his college basketball career at Nevada (freshman Jordan Brown). The other eight have all transferred to Reno, from a variety of other programs. The Martin twins came from NC State. Other Nevada contributors outgrew smaller programs like Wagner, Omaha, Southern Illinois, and Portland. College basketball has 353 Division I programs, yet very few that try to win in new or interesting ways. Musselman’s outright assault on the transfer market is one of the biggest innovations the sport has seen in recent years. Between the Zags and the Wolf Pack, the top level mid-majors will get at least four swings at Pac-12 schools. I’d be surprised if they don’t win all of them. Frankly, I’m more disappointed Gonzaga and Nevada won’t play during the regular season. We’ll have to wait until March to settle what looks like a year long debate. Shane McNichol is the founder, editor, and senior writer at PalestraBack.com. He has also contributed to ESPN.com, Rush The Court, Larry Brown Sports, and USA Today Sports Weekly. Follow him on Twitter @OnTheShaneTrain.